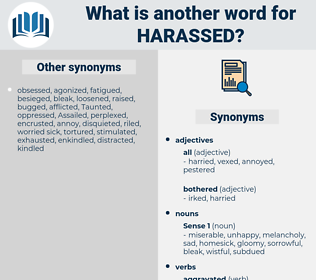 What is another word for harassed? Prosecuted, chased, manufactured, concerned, worried. intimidated, disturbed, bothered, annoyed, Prosecuted, victimized, expressed, assaulted, chased, haunted, Challenged, ravaged, abused, stalked, Targeted, alarmed, troubled, victimised, concerned, Exercised, Attacked, raised, Bled, desired, sought, tapped, plagued, Combated, hunted, worried, beset, Cared, burdened, dogged, wanted. happy, pleased, calm, untroubled, gladdened. facilitate, help, aid, support, assist. But this was no sooner done than they began to be harassed by Gorgopas and the privateers again. This was accomplished, and Friend Hopper was present when the poor harassed fugitive was restored to his family.